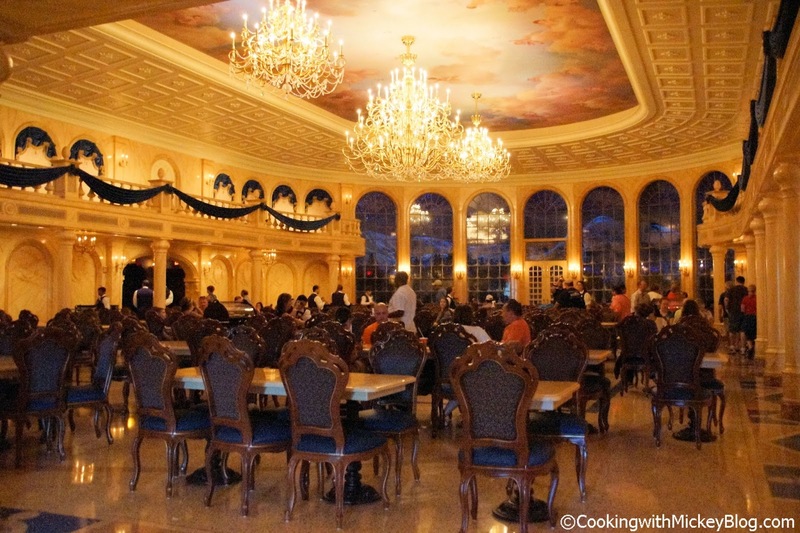 Table service options in Magic Kingdom include Tony's Town Square, Liberty Tree Tavern, Cinderella's Royal Table, Crystal Palace and Be Our Guest Restaurant. 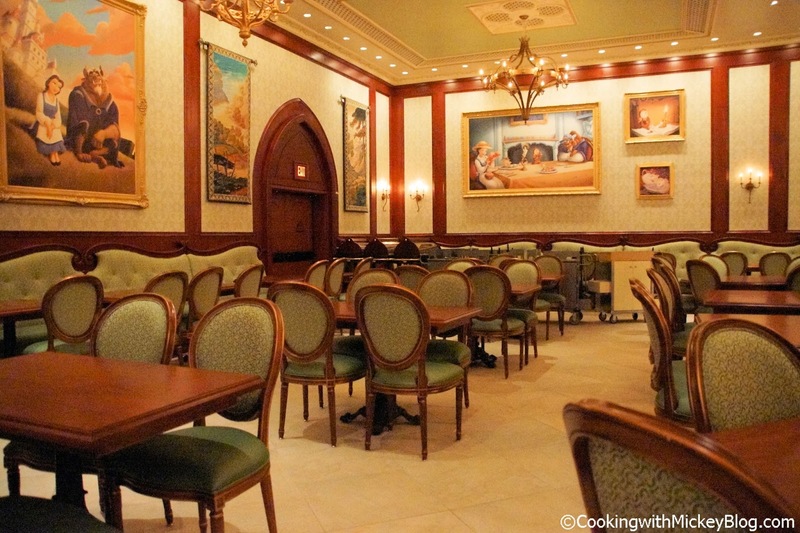 My favorite is easily the newest, Be Our Guest Restaurant. The theming to the restaurant is amazing! There are 3 themed rooms - the West Wing with the enchanted rose and picture of the Prince changing into Beast; the Rose Gallery with a life-sized Belle and Beast dancing, and decorated with portraits and tapestries; and the Ballroom with twinkling chandeliers, large picturesque window where you can see the snow falling and elegant dining room tables and chairs. The restaurant is quick-service for lunch but switches to table-service for dinner. Which is great if you can't get a dinner reservation you can still dine for lunch. You might have to wait 30 - 60 minutes to order though. The wait for lunch is pretty long. The Rose Gallery dining room is only open for lunch so it's the only time you'll have the opportunity to enjoy that dining room. The food is amazing too. Appetizers include unique items such as Assorted Cured Meats and Sausages and Mussels Provencal. For dinner guests can enjoy Layered Ratatouille, Pan-seared Salmon on Leek Fondue and Thyme-scented Pork Rack Chop to name a few. 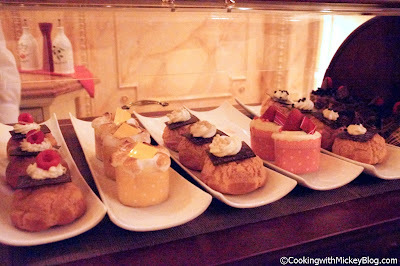 To end your meal there are three cupcakes and three cream puffs to choose from. Also, this is the only restaurant (actually the only place) in Magic Kingdom where you can enjoy a bottle of wine and French and Belgium beer. There are no cheap wines or typical American beers offered here. Everything is designed to compliment the other. I was lucky enough to get a table during the Annual Passholder sneak peak in early November. I was joined by my husband and dear friend, Nancy. For our appetizers we enjoyed the Assorted Cured Meats and Sausages, and the Seasonal Salad Trio. Both were delicious! Nancy had the Rotisserie Cornish Hen (which has since been replaced with the Chicken Provencal), Aljon had the Thyme-scented Pork Rack Chop and I chose the Sauteed Shrimp and Scallops. Everything was really tasty. Aljon's pork chop was cooked perfectly, not dry at all. I did enjoy mine most. How can you not love shrimp and scallops with vegetables in a puff pastry with a lobster cream sauce? (unless you don't like seafood - which I do.) For dessert we each picked something different - Strawberry Cupcake, Passion Fruit Cream Puff and Chocolate Cream Puff. All were wonderful! Between the great food and the restaurant being the most beautiful of all of them on Walt Disney World property, it's my favorite. Which table service restaurant at Magic Kingdom, or Disneyland Park is your favorite? 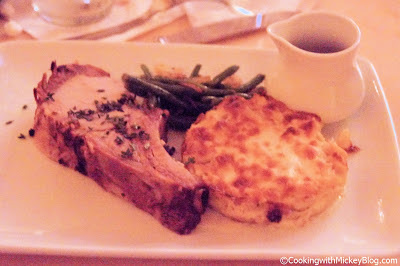 Be Our Guest had some of the best food we have ever eaten at Disney World. Great review of BOG. Can't wait to dine there in a little over a week! Thanks for sharing your experience! I REALLY enjoyed BOG as well. I had a hard time deciding between BOG and CRT, but in the end CRT won out. I am so glad you wrote about Be Our Guest, though, so both are represented as faves. Have a magical day! I REALLY loved Be Our Guest as well. When the topic first came out I thought of writing about BOG but ultimately Cinderella's Royal Table won out. I am so glad you wrote about BOG so that both are represented as faves. Have a magical day!